It's no secret to regular readers of my blog that I love Tommy's the Baby Charity. 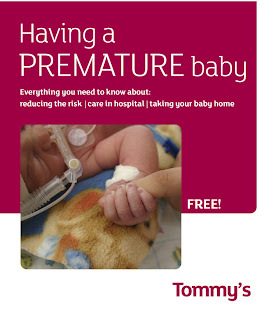 Until Joseph was older I had no idea how important Tommy's is to all pregnant women, conducting research, providing information and looking after the needs of pregnant women to reduce prematurity, stillbirth and miscarriage. I first found out about the plans for the Having A Premature Baby over 12 months ago, and was asked to tell our story. My story appears in short vignettes in the book, alongside the stories of other parents. It's quite amazing to see quotes from me appear in this guide, and I am so proud of it! The guide is produced with thanks to the Asda Foundation. So why do I think having a guide like this is so important? Whilst a lot of premature births are spontaneous, many women know they are at risk. This guide is non-threatening, its is reassuring, but above all, it is informative. Just seeing pictures of how your baby might look, and a guide to the equipment used is invaluable. Unlike me, who had been in a NICU a few times before I had Joseph, many women have never set foot in one. You can read more about the guide on Britmums here, and I have told our story for the Indpendent Online today too. They won't even need to pay p&p, we've just found out!